Poor Khalil. I expected him dead, but well...maybe he's close to it. I'd feel sorry for Todd but he's already doomed too. The visual of that cyborg-spine twitching on the street in front of Khalil was chilling. Yeah, he's way too enthusiastic with his new techie-henchperson role for pitying. I'll be fair to Todd: once Tobias targeted him he was doomed no matter what and had no choice but to take the offer and now he's on borrowed time. Tobias would not have let him go. So well, I guess enjoy it while you can. Jen, Jen, Jen. I hate to tell you this, but you're an idiot of the highest magnitude. Next time you're planning to go on the run and escape from the U.S.A. get somebody who knows something to do your travel planning. Seriously, girl, nothing good ever happens in Bialya (unless maybe you're Dan Garrett, but even then, that didn't work out so well in the end). If you thought going on the run with Khalil was a bad idea, thinking about heading to that particular country makes your current experience on the lam look like a walk in the park on a bright summer's day. So now we're up to the Masters of Disaster. Given how wildly divergent characters on this show have been from the comic book origins, I have no real idea what to expect. 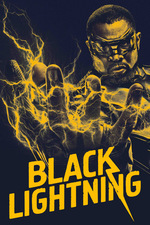 From the set-up it sounds like it's the project that gave Jefferson and (presumably) Looker their powers, and it seems there should be two other outstanding original test subjects, but the original team didn't include Pierce and were actually presented as opponents to Black Lightning and the Outsiders. Khalil should have been dead after Tobias ripped out his spine. Credibility and believability were certainly being stretched way past thin during those post-attack scenes. I really wanted to smack that preacher for praying rather than doing something useful like calling for an ambulance (or directing his parishioners to do so), gathering up the spine, putting pressure on the wound to attempt to stop the bleeding, etc. She was saying "Bahia", a state in Brazil, which is why she brought up learning Portuguese. It's a little dumb that Tobias didn't make sure Khalil was dead. He was still breathing when Cutter and Todd carried him out. Sure he can't walk anymore, like previously, but he can definitely still talk.